"Fresh. Organic. Local.” That is the slogan that greets you as you walk into Malibu's much-loved oceanside eatery, the Malibu Farm. It was just four years ago that Swedish-born chef Helene Henderson opened her first restaurant on the historic Malibu Pier. 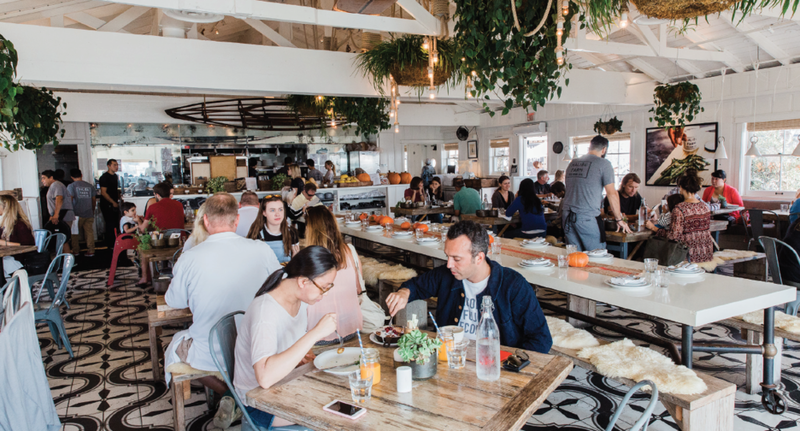 Malibu Farm Café quickly went from pop-up restaurant to tourist destination, extending its stay permanently and eventually adding a more formal dining experience at the foot of the pier. “I want all the food to feel like coming home,” said Henderson. And that it does. Henderson did not begin her professional life in the restaurant business, but after her home (the original Malibu Farm) accidentally became one, she decided to stake her claim. She started modestly, cooking for friends with fresh ingredients grown in her garden. Soon she realized she was filling a void that locals never knew they had. Henderson credits her prime real estate location to her husband, who was the first to inform her of the vacated Ruby’s diner space on the 112-year-old pier. The move was a risky one for Henderson, who had watched many restaurants fail at the Malibu Pier location. There was a definite possibility for failure. Henderson recalls fearing the location would never make money, and questioning customers' willingness to make the trek all the way down the pier. In the end, however, Henderson’s trepidations were put to rest, and her decision to open her first eatery in the storied location definitely paid off. "Simple, rustic decor, healthy food, and a social media campaign run solely by me proved to be the recipe to success," she said. It was her longtime friend, local Malibu designer Vanessa Alexander, who helped Henderson channel her “simple Scandinavian sensibility.” Henderson ultimately credits Alexander with “transforming an abandoned red vinyled Ruby’s at the end of the Malibu Pier into the Malibu Farm Café.” The aesthetic encapsulates what it means to dine at Malibu Farm, or for that matter to live in Malibu itself-- simple and comforting but never dull. Indeed, the restaurants have become so intertwined with the definition of Malibu culture it is difficult to picture a pier without their presence. Henderson’s career before the farm was just as dynamic, from modeling and then graphic design, to an eventual transition into catering and cooking that brought her to where she is today. Henderson sits at her usual table, the early morning sun bleeding through the windows and the pier beginning to bustle with life. This isn’t the location Henderson had imagined when contemplating opening her own restaurant. Her original vision was to find a space that stayed true to the ‘farm’ portion of the name. When hosting her dinners, Henderson would station different food items throughout the farm. “When you came to a farm dinner you would get this little welcome sheet and it would say something like, 'in the front yard meet the chickens and have deviled eggs, in the barn meet the goats and have goat cheese pizza,'" said Henderson. She admits she is not the biggest fan of the water and even needs to wear a motion sickness bracelet when the tide is high down at the pier. She had originally envisioned a space surrounded by wilderness, perhaps even a garden, places where Henderson says she would love to open a restaurant in the future. But for now Malibu Farm, so synonymous with its oceanfront, could not be pictured anywhere else. The space she has created is dream-like, suspended above a stretch of cerulean surf. The rustic, beach-y demeanor of the restaurants embody a culture of Los Angeles dining that is often lost in insincere attempts at recreation. Henderson is the original. As a personal chef to what she calls, “the quintessential LA family,” Henderson became familiar with what people wanted and needed in a restaurant. “When you start spending that much time with other people’s families, you just start to get a pretty good sense of what people actually are eating,” said Henderson. She still keeps family in mind when creating new recipes. Henderson tries to envision what each member of the family would want, including the health-conscious mother, selective kids, a husband with a hearty appetite, and disillusioned relatives from out of town. She wants there to be something for everyone. Henderson is often asked how she gets her three children to eat her hearty health-conscious cooking. The answer is simple. "You don’t worry about what they eat, you just eat,” she says. If there’s something for Henderson on the menu, it’s breakfast, which she eats at least twice, if not three time,s a day. She credits this love to her Swedish heritage, which has a visible influence on her menus. A smorgasbord is a necessity for Henderson. “One of my biggest pet peeves is when someone just gives me a sandwich,” she says. No plate at Malibu Farm is simply a sandwich, and almost all abide by Henderson’s three side rule, her own kind of smorgasbord. Taking her farm-to-table idea to tables outside of California happened faster than Henderson could have expected. Meir Teper, co-owner of Nobu Malibu, has been a personal friend of Henderson’s for years now. He was one of her first customers on the pier, and the two formed a close bond which has led to many business ventures. Henderson believes Teper has an indisputable talent for knowing what the community needs. Teper introduced Henderson to Larry Ellison, founder of Oracle, and owner of Four Seasons Lanai. Ellison has long been a driving force behind Malibu’s changing social scene. He owns several homes along Carbon Beach, the property that houses the Nobu restaurant, as well as co-owns the Nobu Ryokan hotel. Together the two have helped take Henderson’s pop-up on the pier to two new shores already. The Malibu Farm Café had only been open a few months when a new location across the United States was proposed to Henderson. She was offered a space in the new Nobu Hotel Miami, in the renovated Eden Roc hotel. Following this partnership, Ellison wanted Malibu Farm to be the new poolside eatery at Four Seasons Lanai; she opened three months later. Henderson is preparing to open her Miami location in a few weeks. She expects the location’s first year to work like Lanai, with upwards of five visits. Henderson says it is funny now to think the Miami restaurant has been in the works for two years, a move she says she may not have been ready for at the time, but is now anxious to see through. Her new locations may not be within the confines of the Malibu coast, but they incorporate the unique blend of Malibu health and heartiness that have made Henderson a community institution. No matter where Henderson’s restaurants expand to, they take a slice of the Malibu culture with them. Maintaining her motto of “Fresh. Organic. Local.” is a key part of this. That means sourcing from fisherman in Lanai, and growers in Miami. Although the Lanai location was quick to launch, it faced its own set of challenges as a private island. Once known for being the home of the Dole pineapple plantation, Lanai is still largely unpopulated. Henderson says this has made it difficult to locally source, which she always prefers, with its lack of local business. However Ellison will soon be launching a hydroponic farm on the island, providing ingredients worthy of Henderson’s backyard. As even more new locations in Newport and Montecito are forging ahead, its easy to imagine that Henderson will soon become a household name. Even with these exciting changes, Henderson hasn’t forgotten her roots. She still finds herself at the original location almost every day of the week following her morning run and the first of her breakfasts. However successful, she remains humble. Henderson hopes to continue her backyard meals in the near future, even as it may seem there is no time to take off from maintaining and expanding the Los Angeles institution.